St. Anthony of Padua is known for finding lost articles. Well this story in this post will reinforce this belief. A few days ago, a 111 year old crucifix statue was stolen from St. Anthony of Padua parish on 166 Street and Prospect Avenue in the Bronx. This parish is very well known to me. I have served Mass there, attended meetings and participated in retreats and other events. This parish is also the home of the Hispanic Charismatic Center and my friend Bishop Iriondo from the Basque country in Northern Spain. The parish is very ornate. I have even posted photos of it on my Twitter and Facebook some time ago. Anyhow, the disappearance of the century old cross bothered parishioners including the pastor, Bishop Iriondo. He believed it was the job of a "professional" who knew how to remove the large crucifix. However, some parishioners have stated that the crucifix was "loose." This would have made it easy for anyone to uproot it and walk away with it. Despite having no leads, the parishioners prayed for its return. Well just a few miles away in another beautiful church, St. Anselm on Tinton Avenue, Henry Gomez was parking in the parish's parking lot when he noticed a man struggling with a large crucifix. He and the pastor of St. Anselm notified police and realize that the man had the large crucifix which was stolen from the sister parish miles away. Another friend of mine, Father Antonio Palacios of St. Anselm's church immediately suspected that the cross was in fact stolen due to its size and ornate features. 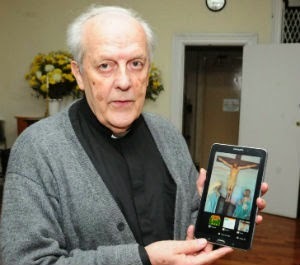 He convinced the man to return the crucifix and he would get a smaller one instead. The man who is believed to be homeless agreed and did the exchange. He was not arrested for the theft. Iriondo said, “We’re talking about Jesus Christ the Redeemer, He forgives us for our sins." The perpetrator was apparently trying to sell the crucifix which is worth over $10,000 for a mere $60. In a show of solidarity with St. Anthony of Padua parish, parishioners of St. Anselm led a procession with the stolen cross to St. Anthony of Padua parish in order to return it. I am glad the cross was returned. The idea of having a procession from. St Anselm to St. Anthony of Padua church was awesome and a great witness to the Catholic family and Christianity. I hope Bishop Iriondo will consider installing cameras at the vestibule of the parish. Perhaps I should send him an email now.